PIERPONT – In hopes of offering a more consistent schedule within their business, Western Reserve Animal Clinic at its location of 1199 Route 7 in Pierpont, is now offering a new veterinarian Rachel Rielinger. (From Dec. 7 edition). According to Rielinger her official start date as a veterinarian came about in June but before that attended University of Akron for her undergrad as pre-vet, followed by Kansas State for small animal medicine. Rielinger said she has always grown up around animals but didn’t consider making it a career until when she first began college. As far as plans for the future while working at Western Reserve Animal Clinic Rielinger said mainly consists of a goal to focus on preventative health of pets. 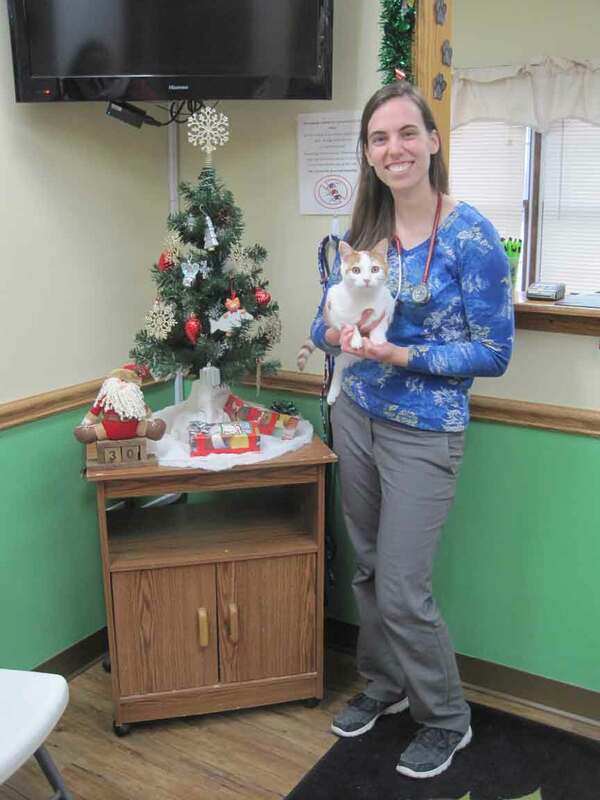 In addition to their options for regular preventative care Rielinger said that she plans to continue offering low cost spay/neuter clinics ever so often that make it more affordable for people that may just have barn cats, while continuing fun events like offering free pet photos with Santa. Regardless of what’s to come Rielinger said that she is happy to be working at Western Reserve Animal Clinic as a veterinarian and enjoys all the people she work with regularly. In her free time Rielinger said she enjoys running, spending time with her new cat, Bob, as well as enjoys studying dentistry and internal medicine of pets. Hours at Western Reserve Animal Clinic include Mondays 9 a.m. until 5 p.m., Tuesdays and Fridays 8 a.m. until 5 p.m., Wednesdays 8 a.m. until Noon, as well as Fridays 11 a.m. until 7 p.m.
For further information about Western Reserve Animal Clinic please call (440) 577-1111 or visit their website: https://www.westernreserveanimalclinic.com/. Pictured: Veterinarian Rachel Rielinger on Monday, Dec. 3 within the reception area of Western Reserve Animal Clinic within its location of 1199 Route 7 in Pierpont.